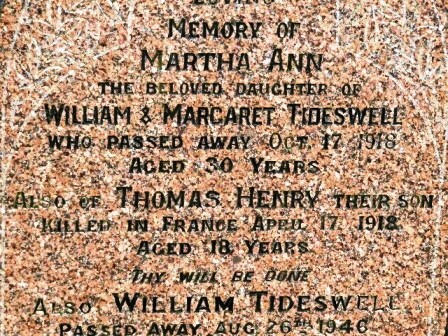 Thomas (known later as "Harry") was born at Harpur Hill, Buxton, in May 1899, the son of William (General Labourer) and Margaret (née Drabble) Tideswell. He had an older brother, John Frederick [see Footnote below], and an older sister, Gladys (1901 Census RG 13/3271). 1917, this was known as 13th Young Soldier Battalion and had no regimental affiliation. (left) and Askey. In front are Privates Fanshaw and Wilson. 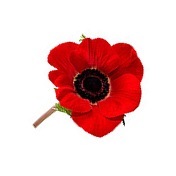 the 5th April transferred to the North Staffordshire Regiment, and was posted to the 5th Battalion. 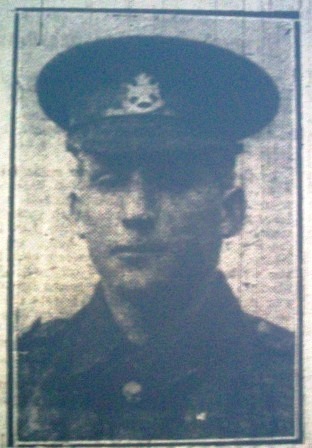 Just 12 days later he was killed in action "In The Field, Belgium". The 1/5th Battalion had been in France since landing at Le Havre on the 4th March 1915. 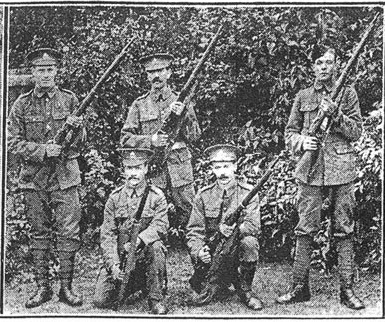 On the 30th January 1918, just before Harry joined his new Battalion, it had transferred to the176th Brigade in the 59th (2nd North Midland) Division and at the same time absorbed the 2/5th Battalion. During the Battles of the Lys, Harry's Division was ordered to reinforce the Lys area that was under terrific enemy attack. A 6000 yard (c. 5500 m.) long line (that is, very thinly held) was taken over near Loker and here in the middle of the 14th April, the units came under violent attack. The enemy broke through on the left and the British line crumbled. Bailleul fell and the 176th and 178th Brigades fell back in disarray on Mont Noir (Zwarteberg). Losses were very heavy. This Battle of Bailleul was followed immediately by The First Battle of Kemmel Ridge (17th -18th April 1918). It was during this engagement that Harry lost his life, one of 24 men of his Battalion killed in action during these two days. 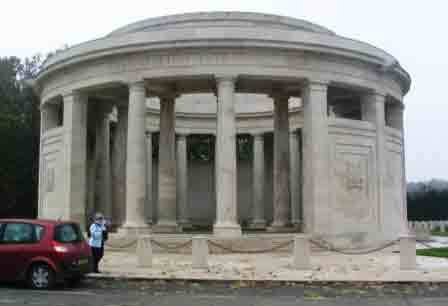 All but one have no known grave and are commemorated with Harry on the Ploegsteert Memorial. "News has been received by the friends of Pte. T.H. 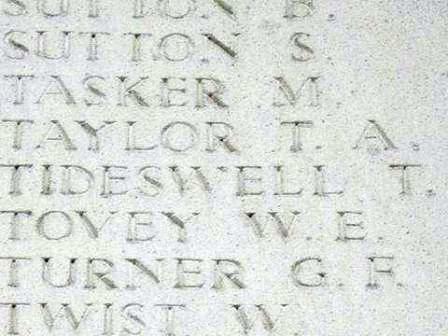 Tideswell, to the effect that he has been killed in action. Monday, prior to which his relatives paid him a visit at Redmires Camp. Pte. 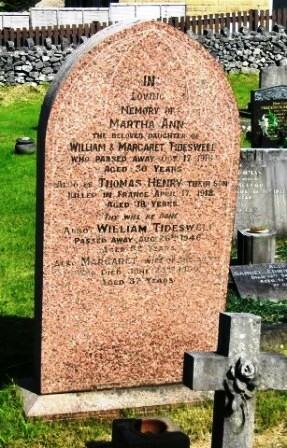 Tideswell was only 18 years of age."